I was born in Cherry Point, North Carolina in April 1959. I remember my mom having other Japanese women to talk to on the military base. They flocked to each other like magnets. We moved around to so many different places it’s difficult to remember exactly where I was during what grades. Just between 1st – 7th grade I lived in North Carolina, Tennessee, California, Florida, Illinois, and Texas. As far as I know, no one was mean to my mom. But she kept a lot to herself, always trying to fit in and look American (I remember her wearing a clothespin on her nose to make it pointed), and dressing up 3 girls to perfection. My mom was amazing and she protected us like a Pit Bull. My older sister, Kim, was her pride and joy: smart, pretty, and talented. Kim was an old soul, and took care of my mom when my dad was away. My mom pushed her to be the best at everything. My mother (Yukiko Moriyama) was born in 1934 to Tatsuo and Moto Moriyama in Kagoshima. She was the middle daughter. She had 2 sisters Kakuko and Kumiko. Her parents both died at a young age. First her father, which I don’t know from what cause. Her mother was pregnant with her youngest sister when her father died. And her mother died about six months after the third daughter was born. My mother was adopted by her aunt and her husband: Yoichiro and Shizu Nakano. She changed her name to Yukiko Nakano. The other girls were adopted as well, to other families. My mother met my dad in Japan. He was in the Marine Corps. They both worked on the base. My parents were married in 1956, and my mom was pretty much disowned when she married my Dad. My older sister Kim was born in Japan in 1957. My parents returned to the States in 1958. We lived in Iwakuni, Japan between 1972 and 1975. We had the opportunity to meet my mom’s sisters: Kakuko Horinouchi (who has three sons: Toshiro, Jungi, and Yutaka), Kumiko (who has three daughters: Mutsumi, Sanae, and Yayoi), and Yayoi, who has a son named Kenichiro Yonekura. 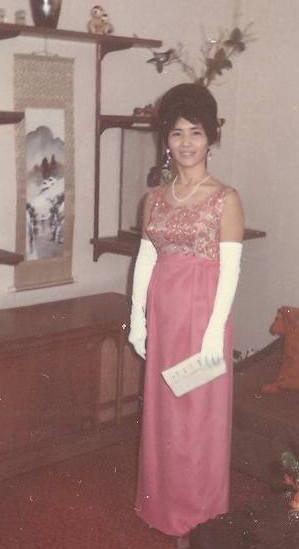 My mom also has an adopted sister, Teruko Nakano, who has a son named Ichiro Nakano (born in 1959). A friend of mine was able to find out that this sister has Alzheimer’s and her son Ichiro takes care of her. However, he will not return any calls, so no one has spoken with him. He really does not know any of us. It’s been over 40 years since we’ve seen my mother’s relatives, and over 25 years since we’ve had any contact with my mother’s side of the family. My mother is now 78 years old. I have only corresponded with my cousin Mutsumi since she was the only one who spoke a little English. But it’s been 26 years since I last wrote her a letter. My older sister Kim died in December 2010 from breast cancer. My younger sister, Andrea is Stage 4 colon cancer. It would be a miracle if I could find my aunts or cousins. We have no idea if they are even alive. Just like they do not know that my sister Kim passed away. Very sorry to for your loss, I hope your other sister is doing well. I’ve also lost a brother. I’m half japanese, half white, 50 years old. It seems that there are not many in our age group, mostly younger people on the forums. I never learned to speak japanese and always felt like an outsider in Japan but never felt quite100% american either. I would like to talk sometime if you’re interested. If you reply, I’ll provide my email. Extremely touching. Thank you for sharing your story. Sorry to hear about your sisters and best wishes for your other one.. I hope you will find your relatives soon. Stay strong and know that the higher power is watching over you and your mother.